at our store at The Entrance throughout September & again, featuring some handmade flowers. Don't you just love these sunflowers? They are just so easy to make too. Throw in a little little mixed media for our background & you have it. These sunflowers are a matching die & stamp set from Heartfelt Creations & are available in our store at The Entrance. First we stamp, then we use the matching die to cut it out & then lastly we colour them with inks & shape them. Sooo easy & so eye catching. 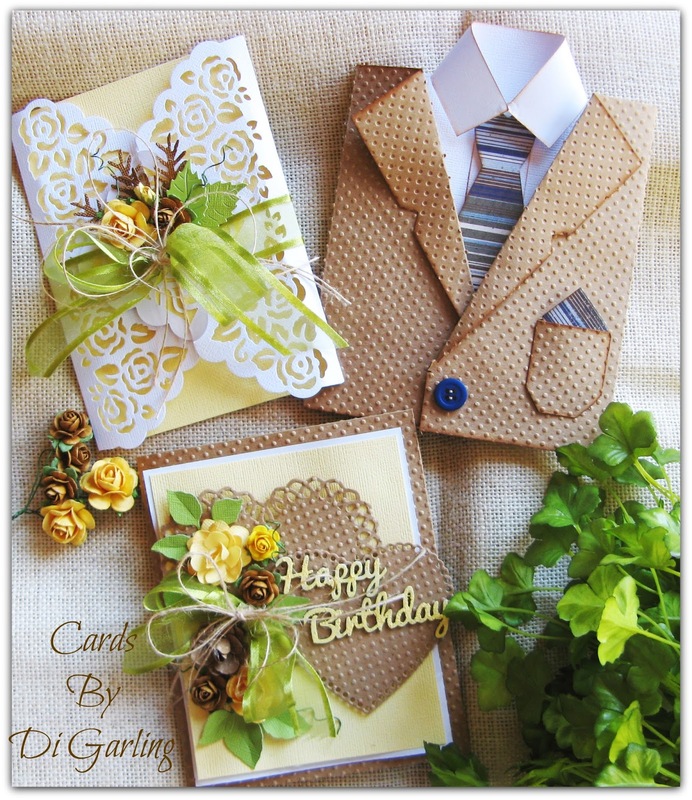 These cards are also available as a kit. Ring the shop to book in in to class on 43344451. Cost is $35 for a 4 hour class & includes all materials & equipment. Hope to see you in class. 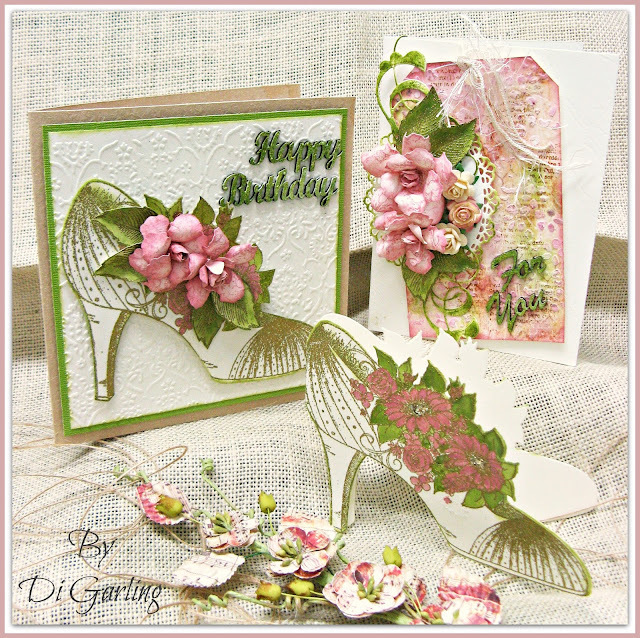 at our store at The Entrance throughout August & featuring handmade flowers, a little mixed media & this gorgeous shoe stamp & die set. First we stamp & heat emboss the shoes, then we use the matching die to cut it out & then lastly we colour them with inks. Sooo easy & so eye catching. These are also available as a kit. Ring the shop to book in on 43344451. These are the card that we will be making in both Di's July card classes held here at our store at The Entrance. ......These are also available as a kit. Cost is $35 for a 4 hour class & includes all materials & equipment. These are the card that we will be making in both Di's card classes held here at our store at The Entrance. The coat one actually opens up & the lacy one opens out from the middle of the front. ......These are also available as a kit. 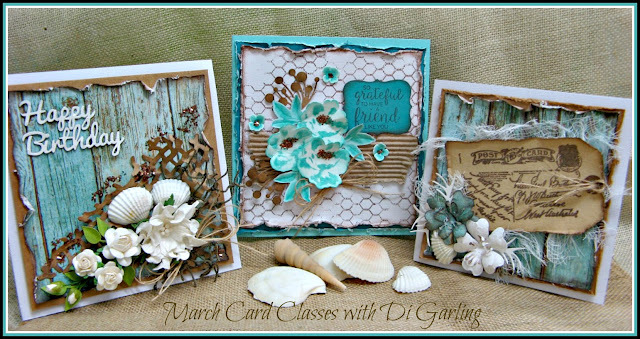 featuring a lovely summery beachy theme. The one in the middle is made with a new stamp & die set, you stamp the flowers first & then cut them out with the matching die. Too easy. As always we will be making all of these gorgeous handmade flowers too. Class Times Friday 11th March from 10am to 2pm OR Friday 18th March from 10am to 2pm Cost is $35 for the 4 hour class & includes all materials & equipment. Even if you are a beginner we help you along the way & you will soon be making cards like a pro. 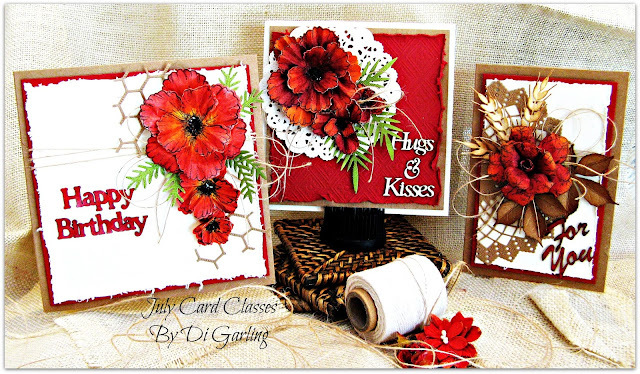 Ring the shop on 433-44451 to reserve your place as our card classes fill up quickly. Pin It Now! 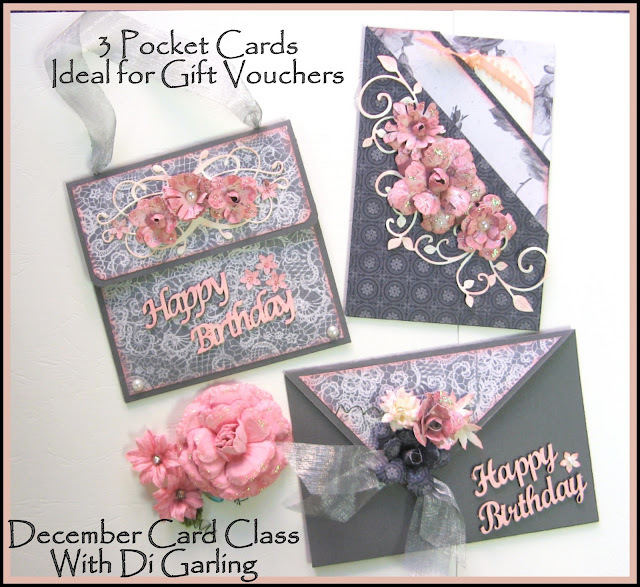 which all have a pocket inside them, so are ideal for giving a gift voucher or money in. These could be easily adapted for Christmas gift vouchers etc As always we will be making all of these gorgeous handmade flowers too. Class Times Friday 11th December from 10am to 2pm OR Friday 18th December from 10am to 2pm Cost is $35 for the 4 hour class & includes all materials & equipment. Hello friends, thanks for calling by. 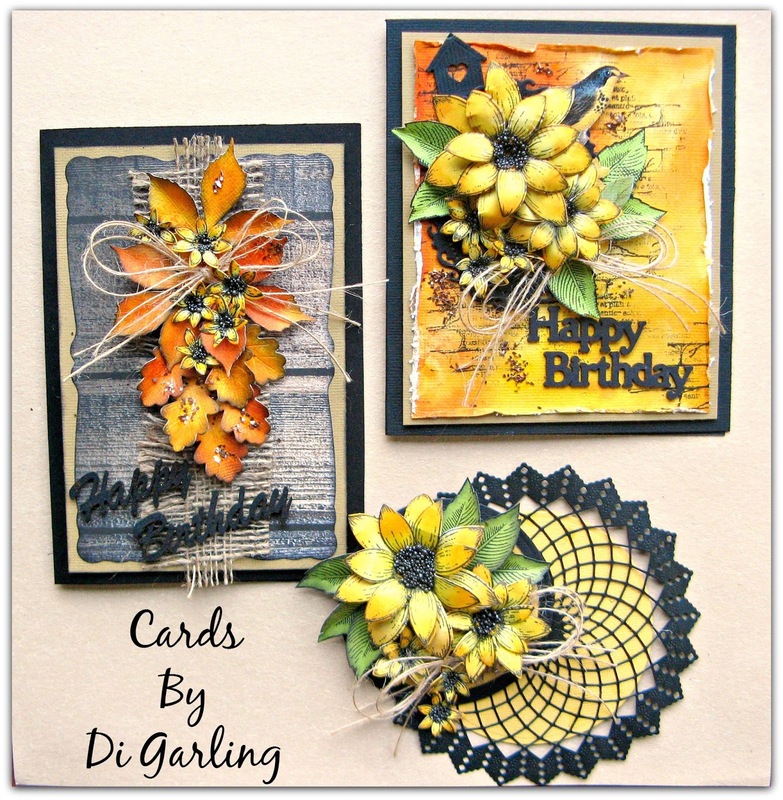 Today I have the three cards that we will be making in both of our November Card Classes. 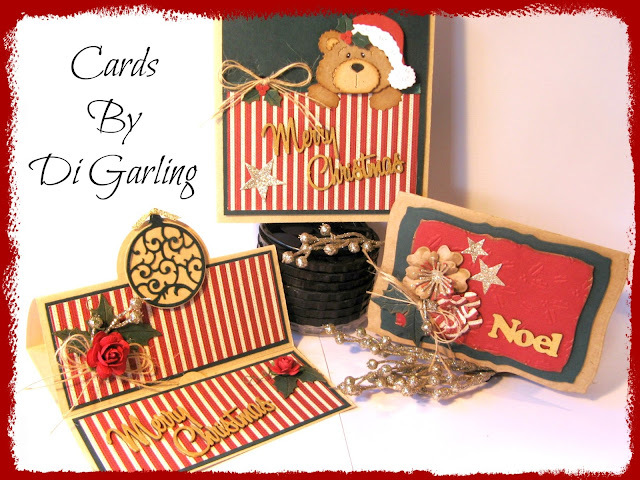 Yes are are doing Christmas cards again this month with a traditional colour scheme with a touch of gold. Don't you just love that little Santa bear & the one on left is an easel card. Class Times Friday 13thth November from 10am to 2pm OR Friday 27th November from 10am to 2pm Cost is $35 for the 4 hour class & includes all materials & equipment.